Usually when I talk about Luna Station Quarterly, it’s while wearing my assistant editor hat. 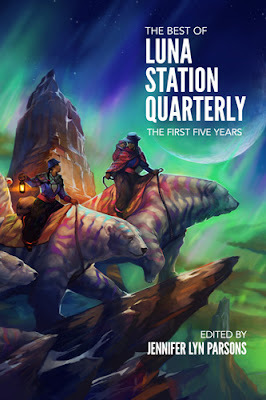 Today, however, I’m wearing my writer hat to announce the launch of The Best of Luna Station Quarterly: The First Five Years, a collection of fifty stories from the (you guessed it) first five years of the quarterly. In amongst those fifty stories is a little (and I do mean little) piece of my own–a science fiction piece called ‘Air’. In total, the book runs to a massive 550 pages, so there’s plenty of other reading in there as well. You can buy it at Amazon, but if you buy directly through Luna, you’ll receive 10% off if you use the coupon provided. It’s paperback only, because this kind of celebration deserves to be held in your hand.